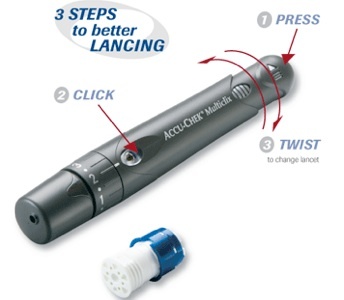 The Multiclix lancing device by Accu-Chek is such a dramatic step up from the lances that Arden has used in the past. You don’t ever again have to handle an exposed lance because the lance is never exposed. No accidental pokes and no possibility of contamination, I’ve never actually seen the metal lancets that reside in that little drum, for all I know it’s a magic lance and there is no needle. This nifty device makes testing a snap and cuts down significantly on the stuff that you have to carry with you. We have been using the Multiclix for over a year now and I can say without hesitation that, “it’s addition to Arden’s bag has been a fantastic one!”. I can’t recommend it enough. Please know that this is a 100% unbiased review. We are not compensated in anyway by Accu-Chek or any other entity. Reviews of devices, meds and such that were compensated would be clearly marked. Amen! We have used this from the beginning and it is amazing! I don't know why anyone would use anything else.